To develop a sponsorship program that mutually benefits the marketing goals of your organization through a partnership with Danny Dietrich Racing and the racing community. Danny is an up and coming driver that has a great deal of popularity coming with that in mind and would try and benefit your business with every opportunity possible. Auto racing continues to grow in popularity. With this popularity, racing venues are seeing larger spectator crowds. Larger crowds equate with greater identity awareness for your products or services. Danny Dietrich, at just 21 years old and has a growing fan base throughout the Northeast. He has been racing sprint cars for 7 years and has made the jump from 358c.i. sprint cars to 410c.i. sprint cars this year and has done well with many top 5’s and a win to add to his rookie season. Danny is well-spoken, educated, and fan-friendly person, and he could be a great spokesperson for your business. Professional team representation. Danny’s racing team is first-class and will represent your company on and off the track. Danny can and does do show appearances with the car, radio and television interviews, and print advertisements promoting your products. 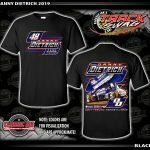 Exposure on www.dannydietrich.com as a sponsor with a link to your website will drive new traffic in the way of new customers. Media exposure through press releases following each racing event when Danny is in action will bring attention to him and your business as well. Danny competes in approximately 40-50 events a year and has about 15 races left in the 2009 season. Each sponsorship program should and would be crafted to meet the goals of your company and those of Danny Dietrich Racing. Please use the list of potential promotions, events, and marketing particulars listed below as a guide in planning how you would like to proceed with a racing sponsorship program. We can discuss these items and discuss costs following your review. Company logo on team car(s). Location negotiable. These items are just a brief list of options available through motorsports marketing. We are willing to work with you to customize a program that will meet your goals and budget. We would like to thank you for the opportunity to present a sponsorship proposal which puts the fastest growing spectator sport in what can ideally be a winning business relationship for your business and the customers who are our weekly fans.